This ** former ** 4 1/2 star B & B is situated in Downtown Truro in the center of the Province and known as the 'Hub" of Nova Scotia. 60 minutes from the Capital City of Halifax, 45 minutes to the International Airport. We are en-route to Cape Breton Island, NFLD & PEI Ferry's. Operated from 2009-2013 as a B & B, this home is set-up perfectly for such an endeavor with 4 bathrooms up and one down. The huge kitchen with center island makes food prep and clean-up a breeze. W J Kent house is a Registered Heritage Property and has been meticulously restored to it's 1890 grandeur. It sits on a new full 9' foundation. Restoration also included new clapboards, exterior trim, wrap around veranda totally rebuilt, plumbing & wiring replaced and inspected, all plaster ceilings, wall & cove moldings, oak woodwork and hardwood floors retained and repaired to perfection. The parlor, foyer, and dining room are wallpapered with period appropriate reproduction papers with wide cove & medallions painted in multi-colors to suit. It is furnished in antiques with period carpets and custom draperies some of which will remain. There are 4 bedrooms, 5 bathrooms with an office or 5th bedroom on the main floor. The new kitchen, although modern was handcrafted to emulate those of the 1920's. 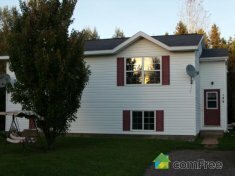 The house sits on a Â½ acre lot and provides lots of room for off-street parking. Also included are a single car garage and a new 1 Â½ story Carriage House that is insulated, wired and has in-floor heat. Excellent potential for other business uses. Photo's available for all rooms & interior of garage and carriage house, architectural details of interior and exterior and close-ups of imported wall coverings, custom draperies, carpets, antique light fixtures, etc. Copy of Municipal Heritage Property Act and zoning requirements available on request. The 100-Series Highways are a series of arterial highways in the Canadian province of Nova Scotia.